What horrors lurk beneath the Red Hood? Could it be a craftsman with a piece of dirty wood? Roy doesn't know. Kori's all a glow! And the rest of the gang are up to no good. Now you do know who I'm referring to, don't you? It's the Writer: James Tynion IV; the Artist: Julius Gopez; plus the Publisher: DC Comics, in March, 2013. Using GENERAL terms, answer the following 4 questions about this STORY entitled 'Communion'. 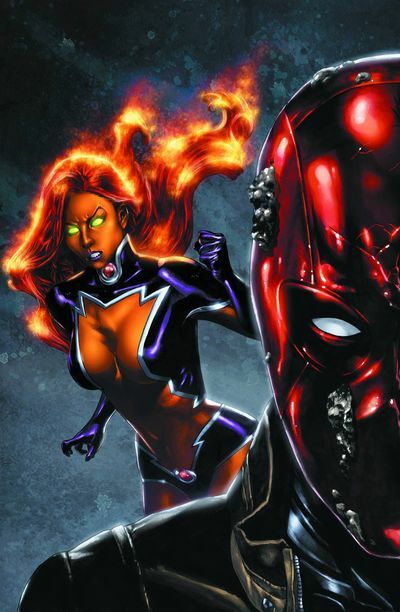 WHAT'S THE MAIN THRUST OF THIS TALE: Concerned about Jason Todd's sudden disappearance, his two team-mates, Kori and Roy, travel to the Himalayas, to seek him out. ARE THE MAIN OBJECTIVES ACHIEVED: No. I'm not saying. It might spoil things for you. But what I will say is thanks to Essence's subconscious prodding, these two chums eventually find a citadel their elusive pal frequents -- the 'Acres of All'. ANYTHING ELSE HAPPEN: Durca does a mean Yoda impression. HOW DOES THIS STORY END: With Jason going out of his mind. Literary. 'These last few months working with the two of you... it's the first time in years my life has been worth living. We're good together. It can't be over. I won't let it be'. Ahhh! What a poor bugger. It makes you think that sometimes a direction in life is what some people truly need. (+) My God! Isn't Julius Gopez a brilliant artist! I personally like his bold yet detailed etchings, because they remind me a lot of Fernando Pasarin's great stuff over on 'Green Lantern Corps'. Please keep him DC. Chain him down if you have to. Ha! (+) As I've alluded to up above, I thought one of the most moving aspects about this adventure was Roy's personal involvement in it. I especially got a kick out of that surreal dream sequence with him and his 'players', as in some way it reinforced both the plot and Roy's state of mind within one fowl swoop. (+) Durca as Yoda and Essence as Obi Wan. Nuff said. (-) Now to be perfectly honest with you, folks, I'm not really sure about Jason going all 'hazy maze' on us. I mean, why? Huh? Is there a reason behind this 'spring cleaning' that'll make some sort of sense further down the line? I hope so. Or otherwise all of Scott's hard work at making him a fairly relatable character again, has gone to waste due to editorial whim of fate. (+) I would have liked to have seen more of Kori's involvement in this adventure; because by in large she did come across more as a 'sounding board' than an 'active participant'. I did like her short spurt at the end though. That was nice. Choose TWO CHARACTERS out of this comic book, and then compare them to two WELL KNOWN MOVIE STARS. JULIE WALTERS AS DURCA: Without a shadow of a doubt, Julie could do a wise and somewhat obtuse sensei in her sleep. In fact, she'd be so good in this role; I bet my bottom dollar she'd enhance it more than it currently is. 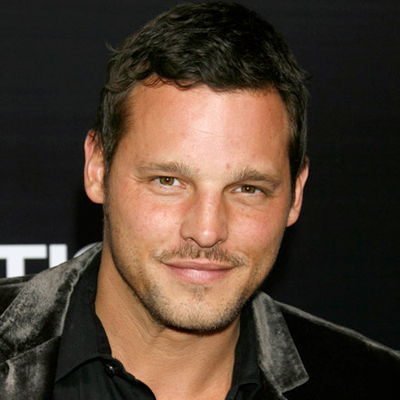 JUSTIN CHAMBERS AS ROY: Go on. Take a good hard look at this sod from the medical drama, 'Grey's Anatomy'. You can tell in his eyes that he has that mournful yet roguish quality about him, and can play this red-headed, quiver-slinger, no problem whatsoever. 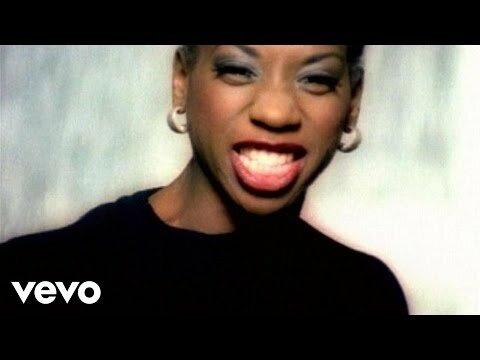 'SEARCH FOR THE HERO' BY M PEOPLE: In a somewhat subliminal manner, both this song and this story are a perfect match. Not only are they both very enjoyable to follow, but the lyrics to this melody sum up what the heroes in this tale are trying to accomplish. Now before I say whatever it is that I am about to say, please let me state for the records that James Tynion IV and Julius Gopez did a really great job on this issue of 'Red Hood and The Outlaws'. The story told a story. The art was amazing. And generally speaking, I've seen an awful lot worse come out of DC Comics within the last month or so. Granted, I wasn't very sure about certain aspects about this tale. Nonetheless, if an adventure can relay a beginning, a middle, and an end, whilst making me wonder what the hell is going to happen next, then it's a good adventure in my book. What do think dear reader? Do you agree with me, and think that James and Julius are doing a cracking job too? If so, please drop us a spam, OK? It's always nice to read what you have to say. GIVE IT, IT'S DUES: If This Comic Book Was a Laxative, It Would Dispose Of Your Bludgeoning Burdon Without a Care In The World. Ha!